In the Volvo XC90 considerable importance has been attached to providing a comprehensive standard specification to reflect the upmarket ambience of the car itself. Luxurious touches such as the use of high-quality materials and upholsteries, and satin chrome inlays for the controls are matched by a high level of standard equipment on all models. Hi-fi enthusiasts can upgrade to the Executive model's Premium Sound system with Dolby Pro Logic II Surround SoundTM and 12 speakers. It includes a 6xCD, FM and AM radio, 5 x 130w amplifiers, as well as MP3/WMA compatibility and an auxiliary jack input to enable customers to connect personal I-Pod players. 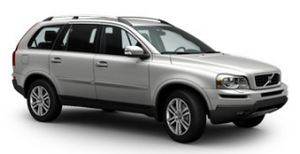 The Volvo XC90 is available in Active and SE (D5 only), R-Design and SE Lux variants, plus Executive trim levels.